One theme became clear for those who attended Howard Weil 2012, one of the premier investor energy conferences. The Cline shale is generating significant industry buzz! From Concho Resources to Devon Energy to Pioneer Natural Resources, the message was focused on the Cline shale and its vast potential. Companies are finding out that below the Wolfcamp lies this highly prospective zone. They are also discovering that the Wolfcamp (some companies are now grouping the Cline together with the Wolfcamp and referring to both zones as the Wolfcamp) is much more extensive, potentially spanning the entire Basin. Because large Wolfcamp acreage parcels are hard to come by, the play is on the verge of a breakout where companies will have to buy out smaller independents in order to establish a sizeable position. Many companies are active in the Permian Basin. Pioneer, Devon, Apache, EOG, Chesapeake, Range and Concho all have positions in the Midland Basin and the Wolfcamp. These companies have market caps ranging from $8.8 billion to $36.0 billion. Although these companies should experience an uptick with Wolfcamp success, another company could see multiples of its existing share price. Lynden Energy Corp. has successful positions in the Wolfberry located at their West Martin project in Martin County and Wind Farms project in Glasscock County. In fact, their current reserves are primarily assigned to just these two areas. Valuations based on these two areas alone would warrant a higher share price. On April 4, Lynden announced the continued success of their Tubb A #1 well. This well has continued to produce oil in excess of 100 barrels per day over the past 90 days since it was tied in. Should this prospect area ultimately be proven out it would support a significantly higher share price. On 40 acre spacing, there are potentially 170 gross locations with the next well to spud later this month and several more prior to year end. We believe that Lynden is considerably undervalued based on their Wolfberry holdings at West Martin, Wind Farms and Tubb. Now, how does this relate to the Cline? Lynden has an interest in 103,400 net acres at an area on the border of Sterling and Mitchell Counties called Mitchell Ranch. The market hasn’t yet assigned value to this land. Land around Mitchell Ranch is becoming scarce and exploration of the Wolfcamp shale is developing around the area. Although Chesapeake, Lynden’s farmout partner on the property, is currently only exploring the Mississippian zones below the Wolfcamp at Mitchell Ranch, it is likely that the Cline shale exists throughout their acreage. In fact, Mitchell Ranch is located near the center of the extent of the Cline shale as depicted on a map prepared by Devon Energy in their latest presentation! 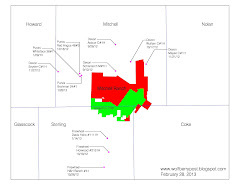 Lynden’s net position at Mitchell Ranch amounts to approximately 34,150 acres. As we know based upon recent Wolfberry land sales, successful Wolfberry acreage can sell for as much as $35,000 per acre or more. Should the Cline shale ultimately become a viable source of oil as the industry is starting to believe, Mitchell Ranch could become extremely desirable. Could the acreage ultimately be worth $5,000/acre, $10,000/acre or more? We believe so! This is where Lynden becomes extremely interesting. At even just $5,000/acre, Lynden is sitting on a very valuable asset. Their 34,150 acres valued at $5,000/acre translates to $170 million. At $10,000/acre this value becomes $340 million. Together with their Wolfberry holdings, Lynden could be a company worth $400 million or more. Given Lynden’s current market cap, this stock has room to run.